According to recent US Census Bureau data, just over a quarter million Las Vegans are age 60 and above. State officials have also hypothesized that this area of our population will continue to substantially grow over the next ten years as seniors make the move to the region. This makes sense for a state with relaxed personal tax laws for a population that is living on limited income. However, sometimes this isn’t enough. Sometimes the fixed income is stretched to maintain basic survival as costs of necessities such as food, transportation, and healthcare fluctuates. This is where the Helping Hands of Vegas Valley steps in. In its eleven year existence, the organization has dedicated itself to caring for the growing senior population. 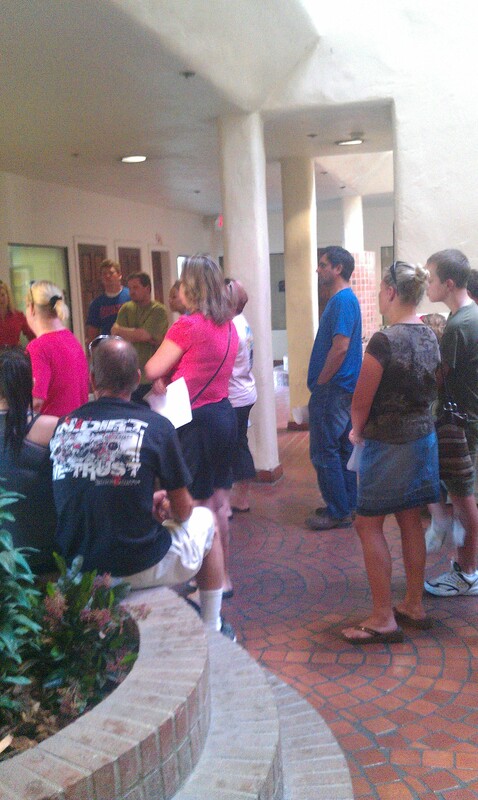 Services offered include wheelchair transportation, volunteer transportation, respite care vouchers, and a food pantry. This past Saturday, a few friends, along my son and I, were granted an opportunity to assist the Helping Hands of Vegas Valley with their food delivery effort, dubbed Pantry Pals. We arrived at the organization by 8:00 AM. After a quick word from the director, we made our way through the check-in to obtain our list of clients and bags of food we would be delivering. My son and I received nine bags of groceries and two small bags of pet food; one for a cat and one for a dog. We got to our car and started ruffling through our client list to determine the best possible route to get the items delivered efficiently. Lucky for us, our six clients were in the same senior living complex. My friend, on the other hand, had four different addresses, but none were too far from the rest. We arrived at the senior living complex by 8:45 AM. Every delivery receipt was complete with special instructions as well, which made the process flow much smoother than it otherwise could have. Our first delivery was to a couple who had been married a lengthy number of years. After some small talk while my son helped place the groceries on their counter, they signed the receipt and we made our way to the car to retrieve the next delivery. The rest of the deliveries were similar with the only differences being the activities the clients were engaged in as we arrived. Some were watching television, others playing cards with friends. When it was all said and done, the opportunity took us a total of an hour and a half. However, the resulting effects of the opportunity will extend far beyond this time, for both the clients and the volunteers. And, as the population continues to increase, I can only imagine opportunities as great as this one will become more frequent. If you’d like to volunteer at Helping Hands of Las Vegas Valley visit the HHOLV Profile on the HandsOn Nevada Website. If the time/dates don’t work for you there are many other opportunities that need volunteers. Visit the HandsOn Nevada Website at www.VolunteerCenterSN.org to find the right opportunity for you today! Las Vegas: the city of sin, the city that never sleeps, the city of neon lights. Beyond the glitz and glamour of The Strip lies the heart of Las Vegas quite often overlooked beyond the wall of the I-15 North. Within the heart of Las Vegas there is a bright, welcoming sanctuary of peace, mercy, and refuge for the poor and homeless. 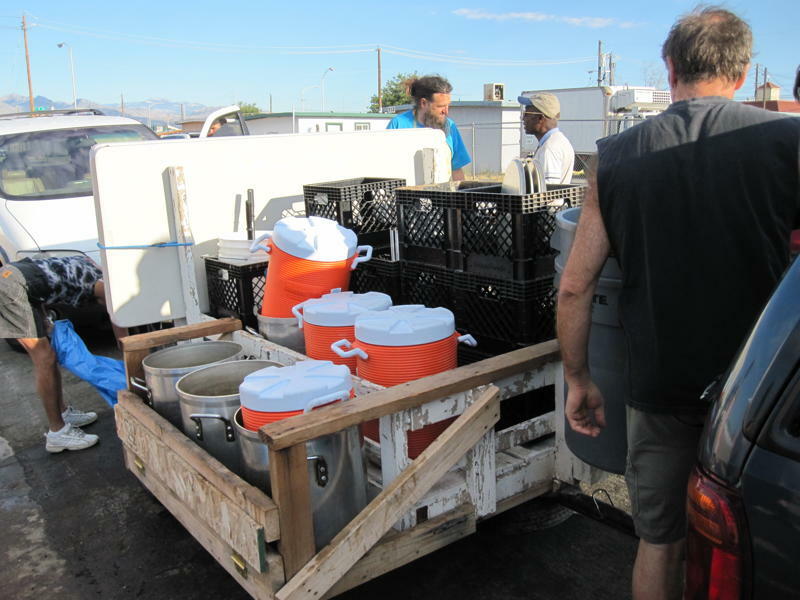 This refuge of those poor and homeless seeking salvation, the Las Vegas Catholic Worker organization, provides means for the community to assist in feeding the hungry, providing shelter and sanitation for the homeless, providing monthly food distributions to families and senior citizens, and holding weekly vigils to spread the message of peace amongst humankind. Their featured project in the volunteer community, Soup for a Smile, supplies the poor and homeless with a flavorful bowl of soup and choices of garnishes, bread rolls, sweets for treats, and selections of tea, milk, and water. This volunteer activity is often featured on the HandsOn Nevada website, and is worthwhile to participate in to make a true difference in the Las Vegas community and if you are looking to brighten the light in someone’s soul and a smile to someone in need. Soup for a Smile is a truly enriching volunteer service for the heart, mind, and soul for both the poor and homeless and the volunteers dedicating their time. Conducted Wednesdays through Saturdays at the break of dawn at 6AM in a historic neighborhood of Las Vegas, up to 200 poor and homeless members of our community can be found gathering for the Soup for a Smile program that is brought to them rather than having to come to the Catholic Worker building (although they are more than welcome to stop by there as well). They are people who come from all walks of life: all ages, all backgrounds, and all ethnicities. Each person has a story to tell, whether through their words or their eyes; one consistent trait noticed is the sudden spark of gratefulness seen in their faces, and a bond shared with those who they can trust. Reaching out to the most needed of Las Vegas’ community, Soup for a Smile is a transforming experience that has the capability to bring compassion to those who are looking to truly assist in uplifting the community from poverty. For more information, visit http://www.lvcw.org. If you’d like to experience Soup and a Smile visit the HandsOn Nevada website. If the time/dates don’t work for you there are many other opportunities that need volunteers. Visit www.VolunteerCenterSN.org to find the right opportunity for you today! You are currently browsing the United Way of Southern Nevada Volunteer Center blog archives for July, 2011.